The Absolute Best Comics And Graphic Novels of 2014! Screw the 1930s and '40s. Comics fans may call it the golden age, but any comic fan knows that we're getting infinitely better comic book than our grandparents did 80-some years ago, and more of them, too. For instance, here are just some of the most essential comics 2014 had to offer. We'll take these over War Bond Funnies #5 any day. And for further excellent reading, don't forget the Best Webcomics of 2014, too! If you've heard anyone talk about comics in 2014, you've had a better than even chance that someone gushed about Lumberjanes to you. 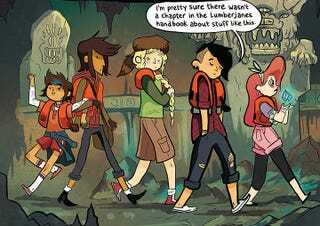 The comic from Noelle Steveson, Brooke Allen and Grace Ellis is universally loved, and justly so — what seems at first glance to be a quirky girl scout adventure becomes a vastly entertaining tale of a delightfully individual troop of campers (named Lumberjanes, natch) whose begin encountering stranger and stranger things in the woods. Much like Adventure Time, it doesn't skimp on the action or humor, but there's also clearly a bigger story at work here (although even if there wasn't, Lumberjanes would be on this list purely for Allen's near-perfect cartoon art). The only question we have is this: Why on god's green earth isn't this a Cartoon Network series yet? Every 90 years, 12 men and women are chosen as gods. They get divine powers and become instant celebrities, but the cost is that they'll die in two short years. Kieron Gillen and Jamie McKelvie examine both religion and celebrity ­— especially noting the many intrinsic similarities between the two — but seeing these reincarnated deities define themselves against each other, with their own schemes, ideals, and fatalism makes for a hell of a compelling saga by itself. Following up the phenomenally popular Scott Pilgrim series seems like a daunting task, but artist and author Bryan Lee O'Malley handles it ably with Seconds, a stand-alone graphic novel which examines the mistakes we make, but from a more adult perspective than SP did. It's a more mature story, one belied by O'Malley's deceptively simple art — a closer examination of which reveals that while his characters may look "cartoon-y," he's absolutely at the top of his artistic game. Anyone who spent their 20s with Scott Pilgrim and his friends would do well to see what Seconds' Katie Clay is doing. If you had to describe French author Fabien Vehlmann and Kerascoet's haunting fairy tale, you really couldn't do better than the title itself. What starts out as a classic, carefree fairy tale of a tiny princess and prince gets a brutal dose of reality when their world collapses, the prince can't cope with the change, and her adorable subjects abandon their own morality with devastating consequences. The juxtaposition between the cute and horrific is incredibly powerful, with nothing more shocking than the realization of where the princess and her people have taken refuge. A beautiful darkness indeed. It seems like forever since a member of the Bat-family has been able to fight crime without some kind of tragic consequence, without the stakes being absurdly high, and/or without an intense, navel-gazing examination of their very selves. Enter the Batgirl of Burnham, the new relaunch from Cameron Stewart, Brenden Fletcher and Babs Tarr, where Batgirl has lost her resources, but gained a great new uniform and a new home in Gotham's hippest district. Barbara Gordon feels vital and unique in a way since her days as Oracle were more or less erased, but moreover, the new Batgirl is terrifically fun. The rest of the DC universe should definitely be taking notes. In concept, creating more Little Nemo in Slumberland, Windsor McKay's brilliant, classic, ground-breaking comic strip about a young boy and his nocturnal adventures, sounds like a terrible idea. On paper, however — and when I say on paper I mean in this gorgeous, oversized book — it works out phenomenally well, as contributors such as Paul Pope, Bill Sienkiewicz, David Mack, John Cassaday, Michael Allred, Yuko Shimizu, J.G. Jones, and many, many more pay tribute to the master with short strips inspired by McKay's work. The stories are as varied as the artstyles, but they all share the innovation and the charm that made Slumberland a masterpiece in the first place. Retelling the history of hip hop in the style of '80s Marvel comics, wasn't necessarily a good idea… it was the best idea. By this year's installment, 1981-83, Ed Piskor's tale has become as epic as the real life events that he's retelling, and turning the artists, producers and others involved into de facto superheroes and villains perfectly matches the outsized personalities of the people who lived it. Even if Piskor stopped with volume 2 here, HHFT would be in incredible achievement, as well as one of comics' greatest nonfiction works. Good thing he's not stopping anytime soon. Afterlife with Archie may get all the press — and not undeservedly so, because it's also pretty great — but Afterlife seems like a mere warm-up for Archie's brilliant, genuinely scary take on the Teenage Witch. While Afterlife is mainly a zombie story (a more grounded Walking Dead, if you will) Sabrina is a sinister, macabre, modern update of the classic EC horror comics of the '60s. Sabrina may have to go to school, but she has to contend with her powers, her mysterious origin and her genuinely Satan-worshipping aunts, not homework. It's supernatural suspense at its best, and of course Robert Hack's wonderfully creepy art is a perfect match. This is a new work by Love and Rockets' Jaime Hernandez. Really, that's probably all you need to know (and it's certainly all most comics fans needed to hear before purchasing it), any time Hernandez has a new work out, the chances of it appearing on a "Best of the Year" list is pretty much 3 out of 4. But The Love Bunglers earns its place by chronicling a new story starring L&R's star Maggie Chascarillo. Now a middle-aged landlord, the weight of Maggie's past — seen in three decades of Hernandez comics — gets full impact in this new chapter in her life and relationships, a story told with warmth but also honesty. Time may have worn down Maggie, but it has done nothing to Hernandez's phenomenal storytelling skills. It's probably saying something that of DC's 2014 events, Grant Morrison's annual madness isn't the most incomprehensible. That doesn't mean his Multiversity series is less ambitious than his other works though, as he's trying not just to reconcile Batman or the DC universe but the entirety history of comics through the examination of the superhero-filled Earths of the multiverse. For goodness' sake, Morrison even took on a facsimile of the Watchmen and not only didn't feel gratuitous and mercenary, but genuinely vital. Whenever Multiversity comes to an end, it may go down as Morrison's opus. If you're a fan of scifi — and given that you're reading io9 right now, that seems like a pretty safe bet — then hopefully you've already been reading Rick Remender, Dean White and Matteo Scarlera's Black Science, which is like Quantum Leap had a baby with The Twilight Zone, which was raised by the smartest, weirdest scientists at MIT, and then forcefed LSD for a few months. Whether you consider it the most entertaining warning against scientific hubris in comics you just like to see the increasingly bizarre and horrible dimensions the protagonists get thrown into, Black Science is a must-read. Do you really need to be told yet again how Ms. Marvel isn't just the best new superhero of recent years, but one of the best comics too? Surely not. Surely if you've avoided picking it up so far, it's because you're broke, in a coma, or hate minorities (or maybe all three). If so, I pity you, because G. Willow Wilson has created an all ages, all gender, all religion, all everything comic that is massive fun, funny and entertaining as hell, and its successful sales prove there's a massive desire for diversity in comics on both sides of the cover. In a just world, Ms. Marvel would serve as a beacon for the entire superhero comics industry. We should be so lucky. Comic biographies are nothing new, but there's something about Box Brown's history of Andre Roussimoff, the 500-lbs., 7.5-foot tall wrestler known as Andre the Giant, that sets it above the pack. Maybe it's the subject himself, who struggled to live in a world that was literally too small to him, but turned his size into strength. Maybe it's Brown's art, whose simplicity evokes tragedy trade-off of how Andre's size led him to celebrity, but left him in constant pain and ill-health. Whatever the secret is, Life and Legend is honest, authentic, and a charming as the giant whose life it chronicles. Like Beautiful Darkness, Emily Carroll's Through the Woods is also a mixture of fairy tales and horror. But while the former keeps the two genres roughly equal, Carroll amplifies the horror, as if they were co-written by '80-era Stephen King and Edgar allen Poe on his bleakest days. The result is an anthology of four stories as captivating as it is unnerving, and its completely unnerving. Protip: Make sure all the lights are on when you read Through the Woods. Leaving aside how nice it is to see a group of female in a classic, D&D-style fantasy world who have full, complex personalities and reasonable outfits, Rat Queen is one of the funniest comics we've read all year. Combining an atheist cleric, a hipster fighter, a "Rockabilly Elven Mage" and more is somehow even more entertaining than it sounds, and any fantasy fan will laugh out loud at the brutal skewering of fantasy tropes, done entirely from a place of knowledge and love. And that's Rat Queens' greatest quality — it may mock the genre, but its still got a good heart behind all the violence, insults, and drunken mayhem.